MacDuff International was founded by Charles Murray, Stewart MacDuff and Edward Thomson in 1992. All three had previously worked with whisky in other companies. Charles Murray was Finance Director with Johnnie Walker and United Distillers ; Stewart MacDuff had been a Sales Director in the Far East for Whyte & Mackay ; while Edward Thomson had previously worked with White Horse and laterly at Whyte & Mackay as Regional Director. So, all three had invaluable whisky industry experience but had left their respective companies and were looking to start their own business yet were waiting for the right opportunity. While Stewart MacDuff and Edward Thomson knew each other from their Whyte & Mackay days they only met Charles Murray in 1991. Immediately they struck a chord and it would not take long until a unique opportunity arose. 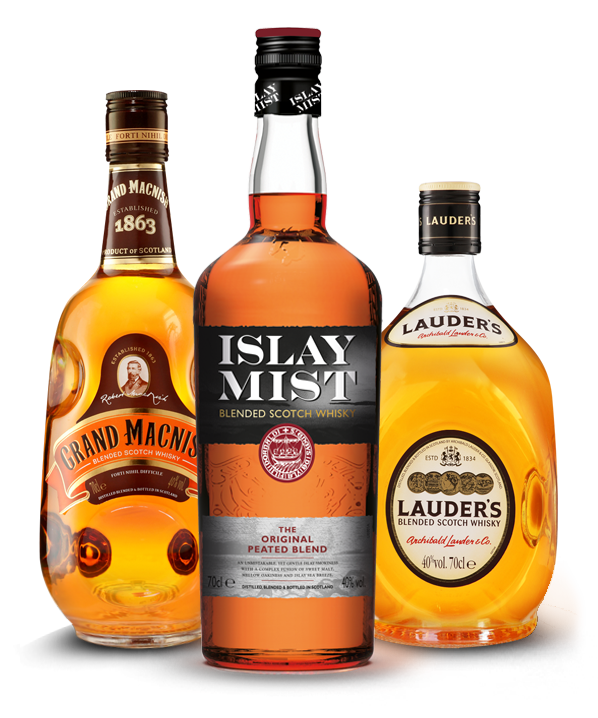 Allied Domecq and Hiram Walker of Ballantine’s fame were looking to sell three brands from their stable; Lauder’s, Grand Macnish and Islay Mist. After intense negotiations, a deal was finally struck and signed in February 1992, complete with enough stock for 6 – 8 years and contracts for new fillings and even bottling at Allied’s bottling hall. Helping to negotiate was a corporate lawyer and his top number cruncher, David Sloan. David helped in dealings with the bank and investment houses and securing the financial package. He was on secondment the first six months after the founding of MacDuff International before he was asked to join the company in a key role. David Sloan was later to become Managing Director and a minority shareholder. Although the 3 brands had been widely distributed in the late 19th and mid 20th centuries by their previous owners, by 1992 they had fallen into a state of disrepair. At the point MacDuff International acquired the brands there were effectively only a handful of live markets and distributors. The initial years of the company’s trading were extremely difficult – interest rates were high, the UK pound left the ERM and the world was in a general recession. The company weathered the storm however, and through the founders’ contacts and knowledge of the industry it quickly increased distribution and by 2000 it had traded in over 30 countries. Ted Thomson retired from his day to day duties in 2003 although he remained a non executive director until 2011. Sadly, Stewart MacDuff passed away in 2008, just a year or so after retiring. Charles Murray retired from his executive role in 2010 but remained on as non executive Chairman until fully retiring in 2016. During the early 2000s the company continued to grow through the close, personal relationships the founders had formed, and it was now being managed by Charles and his co-directors, David Sloan and John Scott. In 2011 a private investor purchased MacDuff International with David Sloan remaining as minority shareholder. The investors and the management team have ambitious long term plans in the knowledge that the company is not for sale and is fully financed by its owners with no involvement from financial institutions or bank debt. The company has continued its path of growth and is in the verge of breaking into the Top 5 in European Duty Free while having already broken into the Top 10 in World Duty Free. Today MacDuff International is a Scottish whisky company with premium brands and the company is highly regarded an experts in developing new brands. Our mission is to maintain a strong focus on building world class brands and to persistently strive to excite our customers and consumers.